Sunday's shooting in the San Antonio-area town of Sutherland Springs is the deadliest mass shooting at a place of worship in American history — and it's also the deadliest mass shooting in Texas history. At least 26 people walked into a Central Texas church Sunday morning and never returned home. 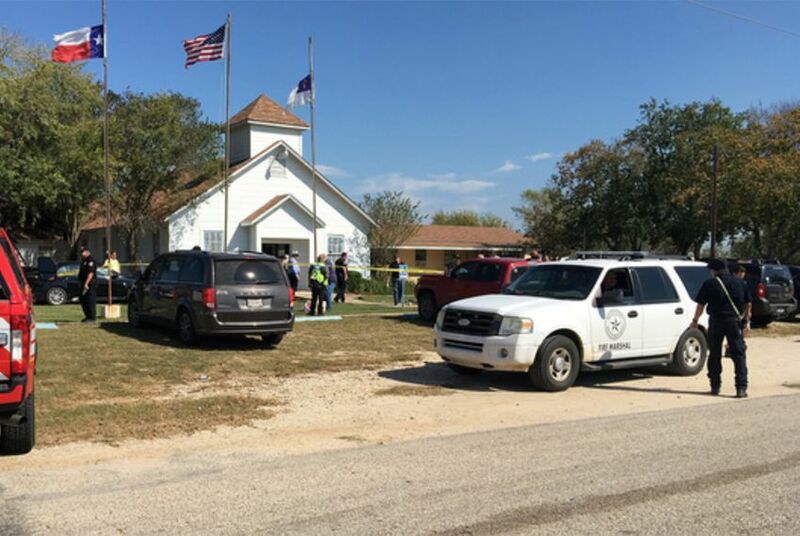 • The gunman killed a 5-year-old, a 72-year-old and at least 24 others between those ages at First Baptist Church of Sutherland Springs. Around 20 others were taken to nearby hospitals with injuries ranging from "minor" to "very severe." Law enforcement didn't officially identify the gunman Sunday and said it was too early to speculate on a motive for the killings — but U.S. Rep. Henry Cuellar, D-Laredo, who represents the area, told The Texas Tribune that the shooter was Devin Kelley of Comal County. The gunman fled the scene after firing inside the church and was found dead inside a car, officials said, adding it was unknown whether he committed suicide. • Sutherland Springs has a population of around 643 — so if all of the victims were locals, as Tribune reporter Alexa Ura points out, at least 4 percent of the town's population was killed in Sunday's shooting. "We're not sure if that number will rise or not," Gov. Greg Abbott said Sunday night at a news conference, referencing the 26 people killed in the attack. "This will be a long, suffering mourning for those in pain." Cuellar said the church's 14-year-old daughter and a pregnant woman were among the victims. • Up until Sunday, the worst mass shooting in Texas history happened in 1991, when a 35-year-old man drove his truck into a Luby's in Killeen and killed 23 people before fatally shooting himself. The deadliest mass shooting in modern U.S. history happened last month, when a 64-year-old fired on a crowd of music festival attendees in Las Vegas and killed more than 50 people. Two years ago, 21-year-old Dylann Roof shot and killed nine people inside a historically black church in Charleston, South Carolina. And exactly eight years ago on Sunday, an Army psychiatrist shot and killed 12 soldiers and 1 civilian at Fort Hood. CNN has a list of the deadliest mass shootings between 1949 and the present. • Prayers — and some calls for tighter gun control laws. "May God be w/ the people of Sutherland Springs, Texas," said President Donald Trump on Twitter. Other Texas officials, such as Attorney General Ken Paxton and state Sen. Donna Campbell, R-New Braunfels, echoed similar sentiments — but many Democrats said the deadly shooting is evidence that tighter gun ownership laws are needed. "Once again gun violence destroys lives, while this Congress, owned lock, stock, and barrel by the NRA refuses to act," said Congressman Lloyd Doggett, D-Austin, on Facebook. We have a compilation of tweets from Texas officials on the Sutherland Springs shooting here. • Trump called the shooter a "very deranged individual" while speaking at an event in Japan. "I think mental health is your problem here," Trump said in a video by the Associated Press. "We have a lot of mental health problems in our country — as do other countries — but this isn't a guns situation. I mean, we could go into it but it's a little bit soon to go into it." • Texas Tribune CEO Evan Smith is talking with state Rep. John Zerwas, R-Richmond, at The Austin Club in Austin this morning. Join us for a conversation with the newly announced candidate for speaker of the Texas House, or watch a livestream here beginning at 8. • The Texas Senate Education Committee is holding a hearing in Houston today to discuss Hurricane Harvey recovery efforts for schools. Follow Texas Tribune reporter Aliyya Swaby for updates. • Ross Ramsey says it's easiest to judge public officials the same way you judge folks at work: Are they doing a good job? • How has voting in Texas changed over the years? Here's what several veteran voters told us. • Texas has a host of high-profile legal battles in the works. We're tracking some of the most significant cases. • Counterprotesters at last year's Houston rally say their presence wasn't influenced by a Russian Facebook ad but by the white supremacists who said they'd be there. • The filing deadline for Texas' 2018 primaries is coming into sight — and so are concerns among some prominent Democrats about their party's statewide ticket. • There's a new layer in the debate over protesting the national anthem at Texas' grade schools. Tell us your story. • State Sen. Charles Perry and state Reps. Dustin Burrows and John Frullo talked with us on Friday about the upcoming race for speaker of the Texas House. Did you miss the event? Check out our recap. • The Trump administration wants the U.S. Supreme Court to invalidate a lower court ruling that allowed an undocumented teen under federal custody in Texas to get an abortion. • Another undocumented immigrant — Rosa Maria Hernandez, a 10-year-old who was detained after gallbladder surgery in Texas — is set to be reunited with her family. Texas Tribune CEO Evan Smith is interviewing state Rep. Dawnna Dukes, D-Austin, at The Austin Club on Nov. 7. 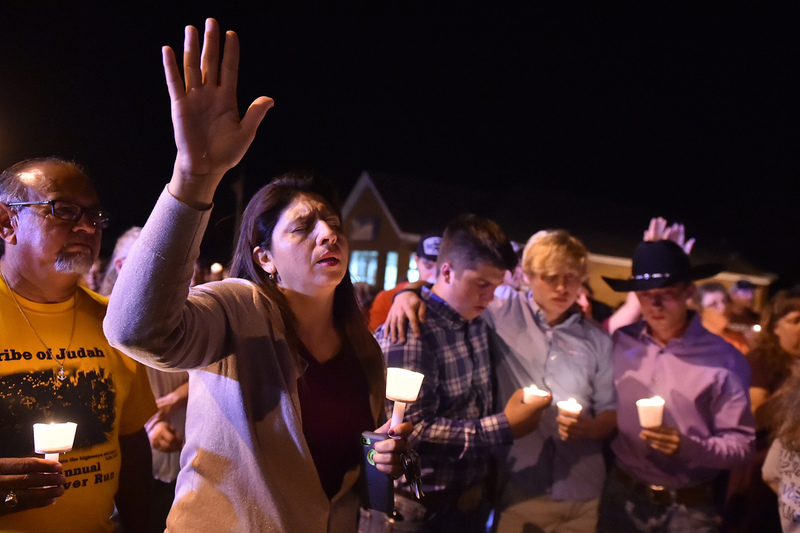 Mourners pray during a candlelight vigil for the victims of the Sutherland Springs First Baptist Church shooting on Nov. 5, 2017. The vigil was held across the street from the church. Photo by Robin Jerstad for The Texas Tribune. See more photos on our Instagram account. "I rule it out 99 percent." — Wendy Davis, the 2014 Democratic gubernatorial nominee, on whether she plans to run for governor again next year. Correction: An item in Friday's version of The Brief misspelled Jenifer Sarver's name.